What are Sapotech goals for this year 2019 and what are your expectations for the company? Our goal for the year 2019 is ambitious. We need to expand our markets and engage customers abroad. Our focus will be on the Americas and Asia, where we received first references already in 2018. 2019 will also be a very interesting year because we will participate in the biggest industry fair (METEC 2019) with a joint stand (Booth D19, Hall 5) with our partner Vesuvius Ltd. The cooperation with Vesuvius started in 2018 and it has enabled us to enter markets that were quite unreachable for Sapotech previously. We expect the partnership to bring even greater value to both companies and our customers during 2019. Technically, this year, we will introduce major technical innovations that will revolutionize the world of surface inspection of metals. We will reveal new technologies that will storm the markets. How do you see Sapotech in the future? Is it changing somehow the way you deliver to customers? Sapotech will continue developing groundbreaking technology and solutions to the markets globally. In the future, our IoT (Internet-of-things) based approach with emphasis on artificial intelligence technologies, will also enable us to serve our customers in more innovative ways. Customers will experience this as greater benefits and increased value from our products. In what direction do you think is the industry moving? The hot topic today is Industry 4.0 and digitalization. This is naturally more and more important to our customers as well. As our Reveal products are designed from the start to be key enablers for Industry 4.0 and Digitalization, we really welcome this trend. 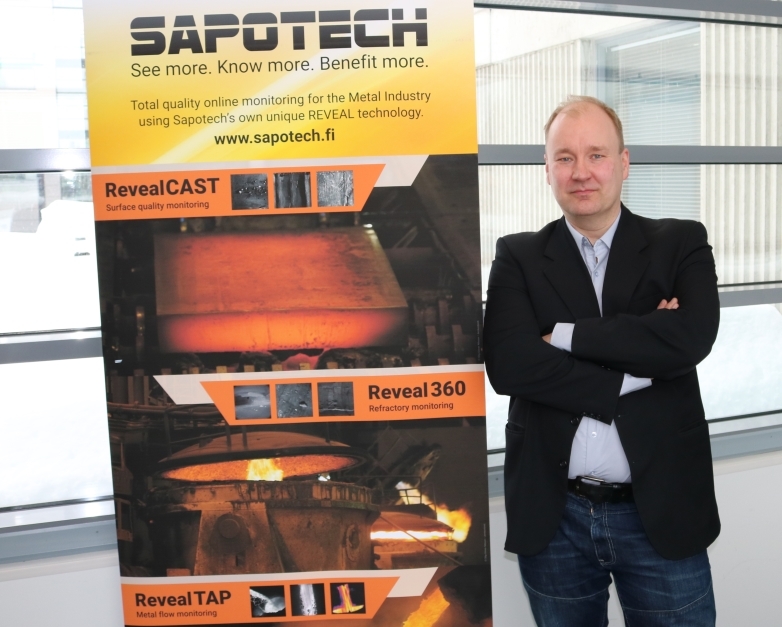 In fact, for majority of our customers, our Reveal Products are the first true and concrete example of Industry 4.0 and Digitalization in the metallurgical sector. This is something the customer needs. Concrete steps and solutions to go forward with digitalization. We provide the answer for this need. Further, as customers are improving their data processing capabilities and IT infrastructure, it becomes more and more important that solutions are compatible with this approach. Our Reveal technology is designed exactly with this in mind. We can offer our solutions as cloud based, as hybrid (local+cloud) installations or pure local installations (on local hardware or customer IT infrastructure). As our development is based from start on modern internet technologies, we feel very comfortable in any environment. Can you reveal a bit of the new projects that Sapotech has in store for this year? This year will be the year of Reveal CAST and Reveal TAP. Both products will mature, and new applications and technological innovations will be added to these products. We are also going to release new products that will include revolutionary measurement systems, new service concepts and interesting solutions related to raw material processing and material logistics, for example. All this for our customers in the metallurgical industry!